Today I mark the start of the Democratic National Convention at Work it, Mom! Come on by and let me know if you still have any lingering questions about the candidates. I also remind us all that tomorrow marks 88 years since women won the right to vote. 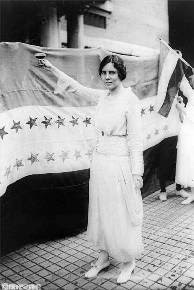 That's Alice Paul to our left! And lastly I list a few blogs where you can keep up with how fellow feministas are taking in the convention. I'm thrilled that Senator Clinton is addressing the Dem Convention on the anniversary of the passage of the 19th amendment. It is a great way to honor her candidacy, AND the extraordinary courage of the suffragettes. It will inspire her supporters to stand by her by supporting the candidate she endorses. Thanks to the success of the suffragettes, women now have voices and choices! But most people are totally in the dark about HOW the suffragettes won, and what life was REALLY like for women before they did. Now readers can discover the shocking truth, and it's as easy as opening their e-mail. "The Privilege of Voting" is a new free e-mail series that follows eight great women from 1912 - 1920 to reveal ALL that happened to set the stage for women to win the vote. This is no boring history report. Two beautiful and extremely powerful suffragettes -- Alice Paul and Emmeline Pankhurst are featured, along with Edith Wharton, Isadora Duncan, Alice Roosevelt and two gorgeous presidential mistresses. There are tons of heartache for these heroines on the rocky road to the ballot box, but in the end, they WIN! Exciting sequential series of 10-minute e-mails, perfect for coffeebreaks or anytime. We're delivering women's history - and making it free, fast and FUN! You going to be at the blogger meetup tomorrow night?